Calm down all those Roger Moore (or Val Kilmer if you’re a bit younger) fans, I’m not going to talk about him at all in here. Sorry. Instead I am going to talk about something that I am doing at the moment at work (surprise surprise) and funnily enough this is something that Adam Greco has talked about before on the Omniture blog, so I’m going to try and do this in a different style, otherwise I’ll be saying the same thing has he said and I’ll be adding no value at all. 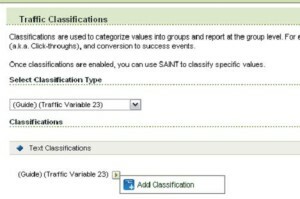 Essentially SAINT is a type of classification that you can do in SiteCatalyst that allows you to classify one of your variables into some different stream, if you can’t code it in on the page. In our case, we have a series of content that are written by people who work in various different departments and in various different teams in those departments and we don’t capture in our CMS what they are. However they are keen to know as a department and team within the department how their content is doing as a whole. This is where the classifications work. We have a list that is coordinated for one group of content that describes this one to many relationship and what we want to do is put this into SiteCatalyst without having to code it into the pages. The process starts rather simply. You have to name your fields. 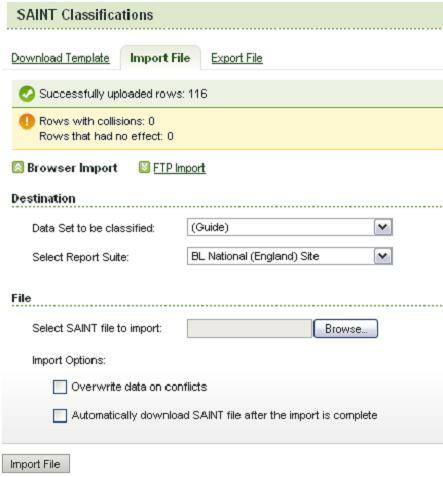 In the Report Suites section of your user management, choose the report suite that you want to add the classifications to and then go to edit settings (as in the image below), choose ‘Traffic’ and ‘Traffic Classifications’. Here in this case, I’ve got my ‘Guide’ variable which I have mapped across to the different departments and am now going to add in one classification of ‘Department’, another of ‘Agency’ and another of ‘Service’. Remember you can add classifications to classifications, but the upkeep may be more (or less) difficult. In this case, maybe it would have been better to create the first classification of ‘Service’ and then a classification of ‘Service’ could have been ‘Agency’. Given the Agency that a Service sits in is unlikely to change that frequently (if at all, but you never know with the British Government), then this may have made more sense. In this case, I’ve actually added in as three separate columns because in some cases there is no real agency or service and these fields are going to be left blank in favour of just a department. Unfortunately there is nothing in these data reports at the moment, because I haven’t told SiteCatalyst which Guide relates to which department, agency and service. So I need to upload this into SiteCatalyst. But there is one thing I need to do first. I need to check the format that we are picking up the guide name in. This will determine how I am going to upload the data. In this case, there is a bit of a difference from just the name of a guide and whether I’ve truncated it to a certain number of characters, etc. I’m saying this deliberately here, because I know I have and I do. It means a simple list of guide names with their associated Department and agencies isn’t going to work. I need to use excel to concatenate the name of the theme into the name of the guide. I also need to check through the work done elsewhere to find any discrepancies. Unfortunately this is a one to one relationship, so any particular piece of content that has two creators is going to have to name one as the main owner. One thing to bear in mind, is that you need to make sure that you don’t save this file in another format. Make sure it sticks as .tab and doesn’t pick up any excel formatting, otherwise you’ll end up not being able to upload it properly. Now it is time to go and look at your lovely data!!! One thing I’d say is that you have automatically created correlations between your different new reports, but not to your original report. One thing you could do would be to create another column in the table that linked these into the original report for instant correlations at no extra cost. I think this is something that I am going to try for next time. ‹ What affect will the online publishing crisis have on web analytics? 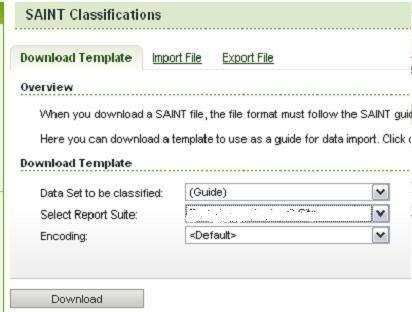 Very well written!The best part about SAINT feature is how many different ways it can be used. 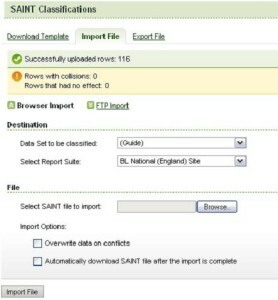 Is it possible to pass multiple, comma separated tag values through SAINT to Site Catalyst for reporting? I’m assuming you mean you want to make the value in the report equivalent to more than one value in another report (eg leggings could be both trousers and tights, so you might want to classify it against both). Thanks Alec! Appreciate your help. 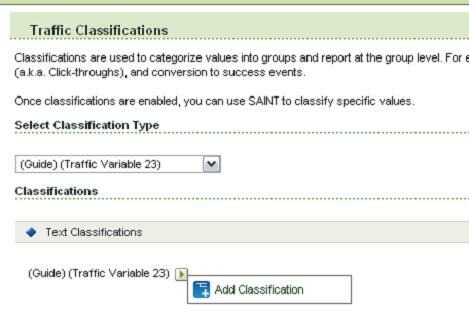 I am trying to pull multiple tag values for 1 tag category into a single column in the SAINT export classification. In your example above, ‘Leggings’ is the tag category and ‘Tights’ and ‘Trousers’ are the tag values. The classification doesn’t accept Tights, Trousers (comma-separated) in the Leggings column. 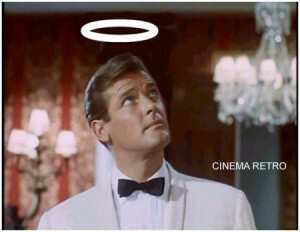 I have gone with #2 in your list above. But as you mentioned, this is inflexible, hard to keep updating when more tag values are added and will miss tag values if the classification is not updated. Can you please suggest/explain some of the options? 1. One option is to include both of the classification in the values: so “Leggings” => “Trousers, tights”, “Jeggings” => “Jeans, Trousers, tights”, Tights => “tights”, “Pop Socks” => “socks, tights”, etc. Then when you run your report, you’ll need to do a search for all the different values of “tights” and then add them together (with the caveat that there may be some overlap in visits that you are basically ignoring). 4. In the SEO world we want to ensure that there is only one version of every page, so we assign each object a primary classification for things like the url. So for example Leggings would only be trousers and not tights. A real world example of this was a retailer I worked with who had ‘womenswear’ and ‘lingerie’ as two different primary classifications and there were constant arguments over what counted in each section (are bikinis ‘womenswear’ or ‘lingerie’ for example). This means your classifications are easier, but you won’t get that nuance. 6. Send each value you’d have as a separate server calls to an existing evar (you can send a secondary server call to Omniture on a page easily so that it doesn’t count as another page view – a bit like link tracking). You’d then tell Omniture that evar1=Leggings, evar2=trousers in one server call and evar1=Leggings, evar2=tights in another, so that you have both values of evar2 in your report.